Nobody ever tells you how hard breastfeeding is. You’re learning, the baby is learning and in the meantime you have about 100 people telling you how its done. Some people have no trouble at all…it comes natural to them, but others fight and try and struggle and do everything they can and still have no luck. I was able to breast feed Sadie for about 3 months. Everything started off very good. As soon as she was born she latched on and away we went. It wasn’t until 2 months that she started to fuss and cry and not seem satisfied with my milk. I fought with her and tried everything under the sun to continue but it just wasn’t worth it for me. I gave in and gave her formula and she was happy as a pig in mud. Nobody ever told me about the herbs and supplements you can try. Nobody mentioned any medications. Had I known more about these things I might of been able to continue to the 6 month mark as planned. When my sister had Gracie, she struggled with her losing weight after she was born and tried everything as well to get her to breast feed more to gain her weight back. She had feeding tubes, and what seemed like daily hospital visits to get her to feed. She too turned to formula after trying everything that was mentioned to her…none of them herbs and herbal supplements. 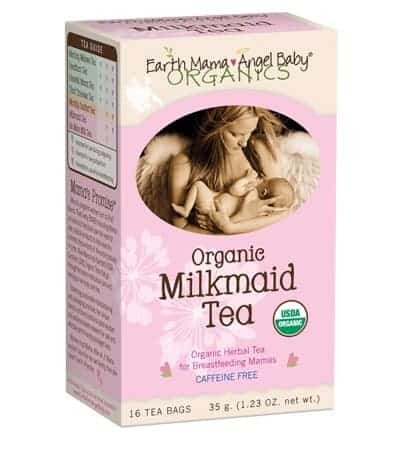 Had we known about Earth Mama Angel Baby Organics Milkmaid tea we might of been able to breastfeed a little more then we did. I was excited to give my review box of tea to a friend who was struggling a bit with breastfeeding. Her baby was 2 weeks at the time and she wasn’t able to satisfy her little one and seemed to be always feeding. She is big into herbs and herbal supplements but have never heard of this product. She was familiar with all the ingredients such as fennel, fenugreek, red raspberry leaf, anise seed, caraway seed, mineral packed nettle and galactagogues, but didn’t know that helped with the flow of breast milk. She thought the taste was great and mild and liked that you can drink it either hot or cold. (sometimes a mommy doesn’t have time to have a hot drink) She really thought it helped with the flow of her milk. She was able to continue to breastfeed and although she doesn’t drink the tea everyday, she knows when she feels that her baby isn’t getting enough and she drinks some tea to up her supply. She says she has ordered more since and loves it. Earth Mama Angel Baby offers products that are nothing but the best for mom and baby. Their products are toxin free, cruelty free, vegan and free from all artificial preservatives, fragrances and dyes. Check them out as they have a product readily available for almost anything. I would LOVE to try the MilkMaid tea! I’m about to drop my calorie intake and I don’t really want to drop breastfeeding! I’d love to have the Organic Milkmaid Tea. I’m due with my second son in March and this would really help out with increasing my milk supply (I plan to breastfeed only for the first year). 1/11 Voted on Picket Fence Blogs. I voted for you on the Picket Fence site today! 1/13 Voted on Picket Fence Blogs. I would like to try the Mint Herbal Lip Balm! AS WELL AS.. *ahem* LOL i also like Earth Mama Angel Baby on my facebook now too! I would love to try the Organic Milkmaid tea! I follow earth mama on Twitter! I like earth mama on FB!